In a sunny fairytale forest there is a special school for young post owls. Keeper and his faithful companion Bella look after their diligent pupils and teach them to be real post owls. But one day something terrible happens...somebody has kidnapped all the owls! Bella and Keeper immediately pick up the trail and give chase to the thief. But the kidnapper is a cunning - he has carefully covered his tracks. 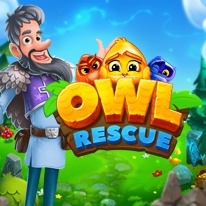 - Play and discover owls’ characters! - 150 forest levels: complete them all! - Tons of available booster combinations: try them out!